The condition “dry eye” is a bit confusing. Dry eye actually refers to the abnormal production of tear film either in quality or amount. Tear film is composed of 3 important layers: oil, aqueous-saline, and mucus. Each layer is produced by special tissues and glands of the eye and eyelids. The oil-lipid portion is made by the meibomian glands inside the eyelids. The pores are just behind the row of lashes. Aqueous-saline layer is made by accessory tear glands located under the upper eyelids. This layer contains much of the needed nutrition and oxygen for the eye surface. The lacrimal tear gland produces “crying” or “flushing” tears and will be discussed below. Mucus is made by the surface conjunctival tissue. If any of the components are missing, deficient, or incorrectly made, an imbalance occurs and the eye surface become unhealthy. The symptoms of an unhealthy eye surface are redness, pains, foreign body sensation, burning, gritty, scratchy, and sticky sensations. Normal tear clearance occurs through a specialized drainage system. The puncta is the opening were tears enter. The canaliculus is the tub that sends tears to a collection area - the nasolacrimal sac. The tears flow down the nasolacrimal duct and finally draing into the posterior nose/throat area. Patients with dry eye can also have paradoxical excess tearing. This occurs when the eye surface is unhealthy from abnormal tears. A signal is sent to the back-up lacrimal tear gland which turns on to “flush” out the eye in an attempt to relieve the discomfort. These “crying tears” are basically saline and of no nutritional benefit and therefore can’t help or maintain eye surface health. Dry eye can occur due to aging, menopause, certain medications, chemotherapy, or certain medical conditions such as eyelid diseases (blepharitis), rosacea, Sjorgren’s, lupus, or rheumatoid arthritis. Diagnosis of dry eye or tear deficiency problems starts with a complete eye exam. Specialized tests are done to determine the volume, quality, and flow of tears. A "Schirmer" test evaluated tear production. Small strips of paper (wicks) lay over the lower eyelids. After 5 minutes the length of wetting is measured. If it is less than 5 mm, dryness is definitely present. If more than 15mm is wet, production is normal, however the composition may be abnormal. InflammaDry - A simple sampling of your tears by a soft swab. The swab is treated with a "developing fluid) This tear chemistry assay will quickly look for inflammation compounds in the tears and help diagnose dry eye disease. Treatment is a multi-step approach. Artificial tear replacement is the typical starting point to rebuild composition and volume. There are a variety of artificial tear products available over the counter. Each brand can vary by cost, thickness, and formulation - preservative or preservative free. Tear saving plugs are the next step. These are small sterile “corks” that prevent the drainage of tears away from the eye, allowing volume to build. They are very comfortable and not noticed by others. Initially, a dissolvable collagen plug is placed either in the lower, upper or both puncta (tear draining duct) opening to gage the response of increased tear volume. Finally, a non-dissolvable plug is then placed in the same fashion, either 1 or 2 to recreate the same occlusion situation. Once the silicone plugs are placed no other maintenance required. Restasis is a specialized eye drop that actually stimulates the tear gland to produce more natural tears. It was derived from a very powerful anti-rejection medication used after organ transplants. It has a long history for successful treatment of dry eye in dogs and now it is available for human use. It is approved by the FDA and it is the only medication of its kind. Success depends on long term use and improvement may take at least 4 weeks of use. Xiidra - This is a new novel prescription eye drop medication made by Shire. 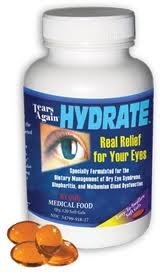 It help reduce and relieve the symptoms of dry eye - pain, irritation, gritty, scratchy sensations. Treatment of eyelid diseases is also important. If blepharitis is diagnosed then hot compresses, eyelid scrub, antibiotic drops, anti-inflammatory drops are used to restore the normal oil gland contribution to the tear film. Call Dr. Gualtieri today at 619-688-2648 to schedule a DRY EYE evaluation. You deserve relief!